The Rainy River gold mine near Fort Frances, northwestern Ontario. Source: New Gold Inc.
New Gold Inc. [NGD-TSX, NYSE American], the company that is grabbling with operating problems at its flagship Ontario mine, has shuffled its executive suite for the second time in four months. Effective immediately, Renaud Adams has been named President and CEO. He replaces Raymond Threlkeld, who was appointed to the role in early May 2018. Investors applauded the announcement, sending New Gold shares up 27.18% or $0.28 to $1.31 in early afternoon trading, Wednesday September 12. The 52-week range is $5.03 and $1.00. In a morning note to investors, Scotiabank said Adams is well-respected by investors after his success with Richmont Mines. He was President and CEO of Richmont when the company was sold to Alamos Gold Inc. [AGI-TSX, NYSE] in November, 2017. Prior to that, Adams was Chief Operating Officer at Primero Mining and General Manager with Iamgold Corp. [IMG-TSX, IAG-NYSE] at the Rosebel Mine in Suriname. “Hard to imagine a better hire,” Scotiabank said. Holding a Bachelor of Engineering degree, he has a strong technical background and is expected to attract talent to New Gold at a time when the company is facing problems at the Rainy River gold-silver mine near Fort Frances, northwestern Ontario. New Gold acquired the asset in October, 2013 by snapping up Rainy River Resources Ltd. in a deal that was valued at $310 million. Rainy River is one of four mines in the company’s portfolio. The others are the New Afton Mine in British Columbia, the Mesquite Mine in the United States and the Cerro San Pedro Mine in Mexico. In a January 16, 2018 press release, New Gold said it expected those mines to produce between 525,000 to 595,000 ounces this year, an increase of 30% on production in 2017, as well as 75-85 million pounds of copper. Of that amount, 310,000 to 350,000 ounces was expected to come from Rainy River. All in sustaining costs were forecast at US$860 to US$900/oz. However, the share price went into freefall after the company later revised its guidance for 2018, saying it expected to produce 415,000 to 480,000 ounces this year, including between 210,000 and 250,000 ounces from Rainy River. This was due primarily to problems at the Rainy River site, including variability in the process facility’s start-up performance as well as lower gold grade and recoveries. 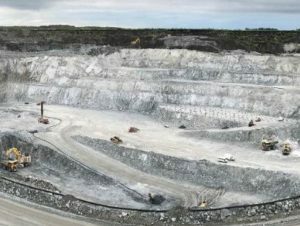 Aside from the lower production, the company is estimating that all-in sustaining costs this year will come in at between US$1,080 and US$1,120/oz. Scotiabank says New Gold is at risk of breaching covenants in the third quarter of 2018. At the end of the second quarter of 2018, the company had $167 million in cash and $959 million in balance sheet debt. The debt balance consists of a $500 million term loan due in November, 2022, $300 million due in May 2025 and $180 million drawn on a $450 million revolving credit facility. Scotiabank says it believes New Gold will seek a waiver to relax the debt: EBITDA covenant and continue focusing on current operations.